We are taking too seriously what is not real and eternal. We may be just one grain of sand in the cosmos. We need to release our consciousness; it has to be free and joyful. Consciousness wants to free itself from unnecessary burdens, tensions and disturbances. Release your consciousness. Where? In its own Self. That is within you. 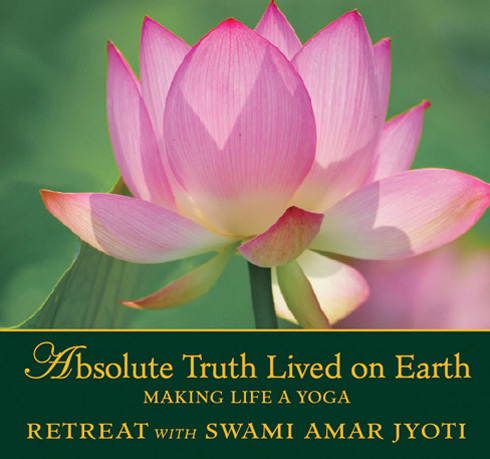 In this 1997 Retreat, Swami Amar Jyoti imparts the real meaning of “retreat.” We need reminders so that we know where we are going. To remind the mind of its purpose, we retreat into Spirit, retreat into God. This is making life a Yoga, living for the Lord. In order to attain a true breakthrough on our path, we need to relinquish our most cherished beliefs and blocks. Masters and Gurus are eager to give if we but allow. Coming in tune with the Lord is needed for transformation. This means surrendering to our Higher Being, a loving acceptance from which healing emerges. We need to recognize Absolute Truth in every aspect of our lives, whether it is family, friendship, work, recreation, music or art. In deep meditation we transcend time and space—the mind comes to stillness.